As you may have noticed from our DesignMarch special in our new issue, Icelandic design is thriving. With this in mind, the panel of our sixth annual Reykjavík Grapevine Design Awards—consisting of various art and design experts—had a great many projects to choose from this year in selecting the cream of the Icelandic design crop. After much deliberation, they selected a varied and inspiring list of fashion/product designers and project organisers who are leading the field in Icelandic design. There are many projects that richly deserve to be recognised, so after you’ve taken in the winners, also look out for the runners-up, honourable mentions and ones to watch in each of the four categories below. We held an awards ceremony last night at Loft Hostel, and you can see some shots form the party below. Congratulations to everyone! Geysir started off as a tourist store, located near the famous natural hotspot. But since then, the brand has reinvented itself to become one of Reykjavík’s leading design stores. Geysir’s first fashion line was conceived with the help of designer Erna Einarsdóttir, MA fashion graduate from Central St. Martins. Her collection is based on products that are wearable and distinctly high-quality. “The collection uses wool and knit in a smart way without being limited by it,” the judges said, with one of them stating: “The line is approachable, and affordable to both downtown cool cats and mature fashionistas wanting to look the part in the great outdoors.” The clothing is inspired by Icelandic heritage, as can be seen in the beautiful vintage tone of their Look Book. Erna has played a large role in helping Geysir become what it is today and is lucky to have such a professional brand behind her designs. The products can be bought at the Geysir stores and at Haukadalur in Selfoss. Magnea, also a young designer and Central St. Martins textile graduate, got to display her talent on an international level when she was offered the chance to work with the Club Monaco design team. The panel of judges said the collaboration represented a cool and modern take on Icelandic heritage and used wool and knitwear to create modern and wearable designs. The products can be bought at www.clubmonaco.com. Elísabet Karlsdóttir’s clothing line, made mainly out of fur, was an entry at the 2015 REMIX competition in Milano. The line was sponsored by Eggert Feldskeri and showcased at his store at a 2015 DesignMarch event. Elísabet has begun working with product designer Ágústa Sveinsdóttir in a collaboration called ALVARA to design an accessory line using leather and fur. It’ll be exciting to see what will come out of their collaboration. Kjartan’s Óskarsson’s design is such an innovative take on a predictable product that it exceeds our expectations of what a lamp can look like. In order to adjust its brightness, the user must turn the hanging Halo. The panel of judges found the interface intriguing: new, but also somehow familiar. They said the interesting use of natural materials piqued their curiosity and expressed the “magical” properties of the halo. The lamp stands out for the attention to detail in its intuitive interface and beautiful design. The Halo has already garnered a considerable amount of attention—Kjartan was awarded the Scandinavian Talents á la carte award at the international Maison & Objet sale show, as well as being the Launch Pad winner at Wanted Design NYC 2015. This line of hanging plant pots has a nice story behind it, about longing for spring after a long winter; as the panel said, it “touches the soul of the Icelander who’s waking up after dark winter months.” Postúlina is Guðbjörg Káradóttir & Ólöf Jakobína Erludóttir, and their products are beautifully handcrafted. Their choices in colour, materials and textures compliment the plants in a simple, elegant way—and it’s a product meant to last for years. Their design can be bought at www.postulina.is. 1+1+1 is an international collaboration of Hugdetta (Róshildur Jónsdóttir and Snæbjörn Þór Stefánsson), Finland’s Aalto+Aalto, and Petra Lilja from Sweden. Each designer creates an object consisting of three modular parts, which are then combined to create unpredictable results. Their products cannot be purchased yet, but a new product will be on show (and for sale) at DesignMarch. Lestrarhestar (“Reading horses”) is a collection of small bookshelves designed to encourage people to read, and to make it more fun. Katrín Ólína used parts from an old machine from Hofsós, originally meant for bending pipes, in the production. She focused on reusing existing materials, giving old machinery a new life. Our panel said: “This product puts Iceland’s literary heritage on a pedestal in a modern way.” Available to buy at Spark Design Space on Klapparstígur. Andrea Maack is a visual artist, and founder of the Andrea Maack fragrance brand. In the process of designing a scent she explores Icelandic nature, trying to capture the feeling of coming to Iceland for the first time. Her perfumes are unisex, because she says that scents have more to do with personalities than gender. While making her most recent scents, “Soft Tension” and “Dual”, she was inspired by the smell of her skin after having been swimming and also the smell of fog. She works with perfumiers to make a high-quality product in a beautifully designed bottle. With these releases, Maack is introducing a new uniform, highly photogenic brand identity. The striking black bottle and packaging were designed in collaboration with Maddalena Casadei at Studio Irvine in Milan, Italy, with graphic design by Tommaso Garner, who interpreted Maack’s original paintings to complete the new brand look. You can order the fragrances at www.andreamaack.com. “A usually forgotten and pretty barren patch of the city center came alive,” said our panel of Laufey and Þórey’s summer market. Unusual items were sold in beautifully designed booths inspired by old Icelandic turf buildings. The market was funded by the City of Reykjavík and for each market day there was a different theme: “straight from grandma,” music, or plants, for example. It was a wonderful way to trade, sell or just mingle in the sun, and will hopefully continue in the summer of 2016. Our panel of judges wanted to specially nominate HA design magazine—run by Arnar Fells (editor), Sigga Maack, Elísabet Ingvarsdóttir and María Kristín (editorial board), and Hrefna Sigurðardóttir (graphic designer)—which specializes in Icelandic design and architecture. 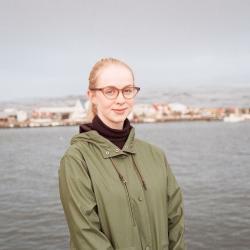 The publication is not only admirable for its fascinating and beautifully laid-out content, but because it’s a milestone in the Icelandic design scene as the first magazine of its kind. Our panel said: “Everything from the layouts to the graphics and the stories are exemplary.” Subscribe to the magazine here or find it in most Icelandic bookstores.